It is a special gift to your lovers! -1.54 inch touch screen, 0.3M camera. -Support 2G Micro SIM card, GSM 850/900/1800/1900. -Band Size: 25 cm/9.84 inch, the band can't be replaced. -Media Social Sync: SMS, Gmail, Email notification, Facebook, Twitter reminder etc. -It looks very similar to an Apple Watch, soft rubber bands wear more comfortable. -Original Crown operation: Crown controls zoom in and out, crown switches interface. Camera remote (Can Not be used with IOS system). -Useful Cell Phone Watch With High Quality: Support All IOS 7 and above or Android 4.3 and above smartphones. -Battery Capacity: 320MAH, talking time about 3 hours, standby time about 12 hours. For normal using, it can be used for about 1 day. 1. Siri Function: Voice Interaction, easily voice to make call, send information, find contacts, etc. 2. G-sensor: Wake-up gesture, Shaking switch main menu, Flip to mute alarm, Flip to mute incoming call. 3. Convenient Sync Reminder Function: Whatsapp, Facebook, Twitter Reminder, SMS, Gmail, Email notification, Real-Time Weather, etc. 4. Ultra Thin With Sync Functions: Connect with phone to sync time, SMS, Dialing, calls, call recorder, contacts, bluetooth music, remote camera and etc. 5. Magic Sound: Through the smart watch, you can change your voice to girls', boys', elder's and children's voice. Change your voice to make your friends a big surprise! 6. 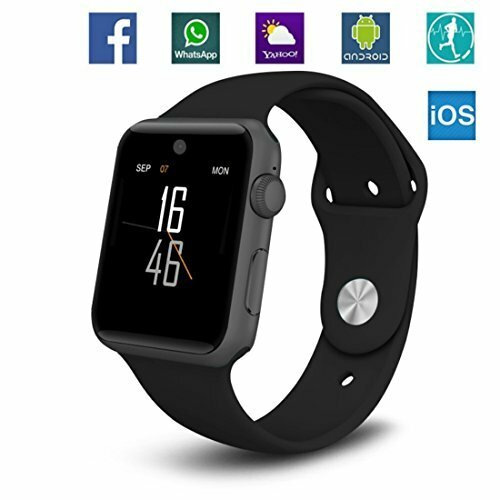 Health Monitor Smartwatch: Pedometer, Calorie, Sleep Monitor, Sedentary Remind, UV Test, Anti-lost, Alarm Clock, Calendar, Calculator, Phonebook, SMS, Stopwatch, etc. Note: SIM card is not included. APP is Fundowear - free. 1. Smart watch have two way mode, dial via smart watch SIM card or bluetooth call optional. The battery last one day during normal use, hands-free function is sufficient for short conversation. With a 2G valid GSM 850/900/1800/1900MHz SIM card inserted, you can making and receiving calls(BT or Local), receiving messages(BT or Local), sending messages(Local), music player(BT or Local). It enables the smart watch to be a standalone phone watch, make the most of every minute in your whole life! 2. Bluetooth 4.0, working range about 6-10 m. All functions support android and IOS smart phones. Compatible with Android Samsung Galaxy HTC Sony LG Xiaomi Huawei iPhone Apple iOS. Support Gravity Sensor, when you see the time, you only need to raise your arm slightly, the smart watch screen will automatically light up. Soft band are comfortable to wear, fashion modern complements to your everyday look. Get the information at a glance, check calls, text, and notification alerts. Very convenient! 3. Smart watch have a voice siri function, practical voice reading function makes the smart watch unique, it can read the Menu, SMS, Dial, Call, Time, Telephone and etc. This special function are very suitable for people who inconvenient to operate by hand or lying in bed when caught a cold or other situation. Enjoying the device and learning to integrate it into you daily life to make some tasks easier.【Baoxin ☎】30-day replacement, 90-day after-sale service time, lifetime technical supports. 4. Listen to your favorite songs on your smart watch via control your phone Spotify Music Player, enjoy your music playing right from wrist. Health Tracker Features such as Pedometer, Sedentary remind, Sleep monitoring, Camera control. You can use the smart watches to track your active indoor and outdoor activities, how many steps you walked, how many calories you burned. It is a good assistant to tell your sport status. Click on the add to cart button now and buy it for your lovers today! 5. 1.54" capacitive touchscreen, 240 x 240 pixels resolution make the screen clear and bright. Please charge the watch about 2 hours before first using. The battery is 320MAH, it can be used calling about 8 hours. For normal mode, it can be used for about 12 hours. Of course, if the smart watches is operated frequently(When listening to musics or shooting picture/video)the battery is slightly faster. Support more than 2-day of standby when No BT connection with the mobile device.